a. be standing and slightly hunched over whilst holding the salteña in two hands, a stack of paper napkins close by. b. eat it by nibbling slowly, and very carefully, from the top, sipping the broth in order to prevent the piping hot, super juicy sauce from scalding your chin and running down the front of your shirt. c. repeat steps a and b, at least once, if not twice, to receive the full impact. d. fall into a swoon. Well, let me tell you, salteñas, ARE a big deal! Sold everywhere around the country at little stalls on the street, at markets or in restaurants called Salteñerias, salteñas are pastry-filled pockets of deliciousness. 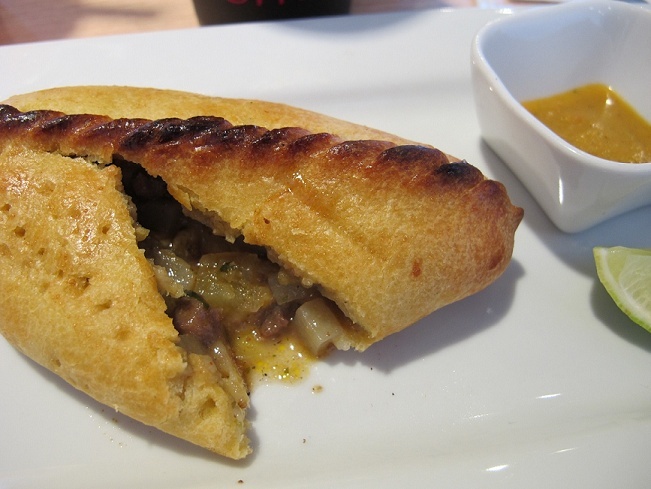 They are similar to empanadas, or, dare I say, a Cornish pastie, but even yummier- muy rico, as the Bolivianos say. Salteñas can be filled with either beef or chicken and usually include finely-diced vegetables- potatoes, of course- raisins, chopped hard-boiled egg, herbs and a rich, spicy broth. 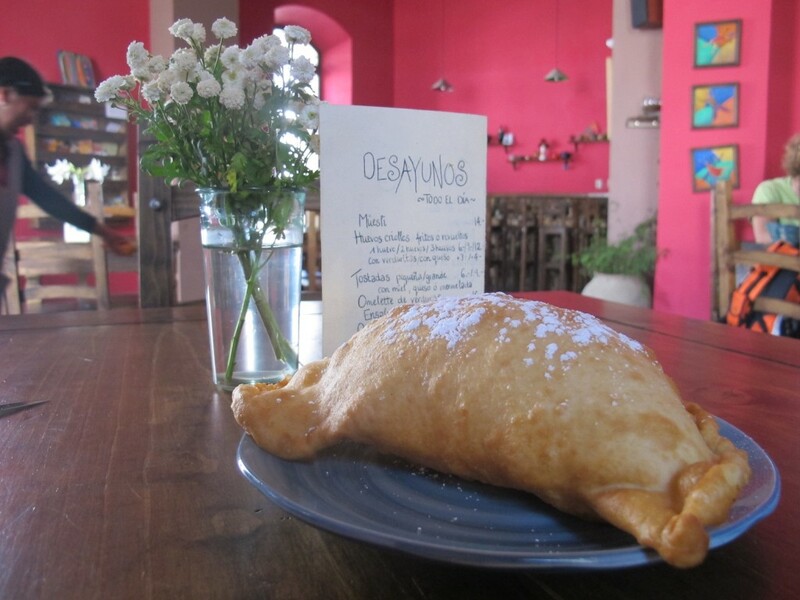 What makes them different from empanadas, is also how they are formed, by braiding the pastry into a perfect seam at the top. 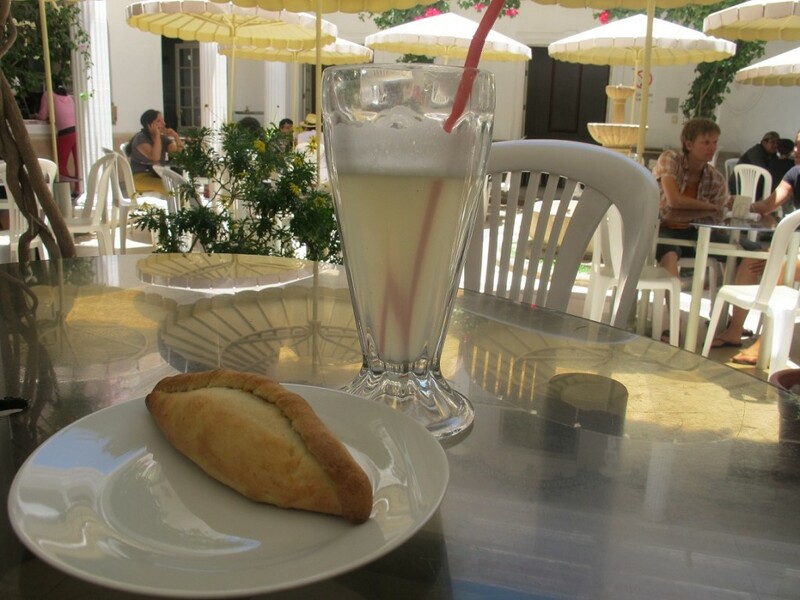 Salteñas at El Patio in Sucre. Sucre is said to have the best salteñas in Bolivia, but this is hotly debated! What I could never figure out was how a salteña managed to be crispy on the outside and moist and juicy on the inside? So, I looked it up! Apparently, the filling includes gelatine. After it is made, the filling is cooled and then the pastry is filled, sealed, fluted, brushed with a glaze and baked. 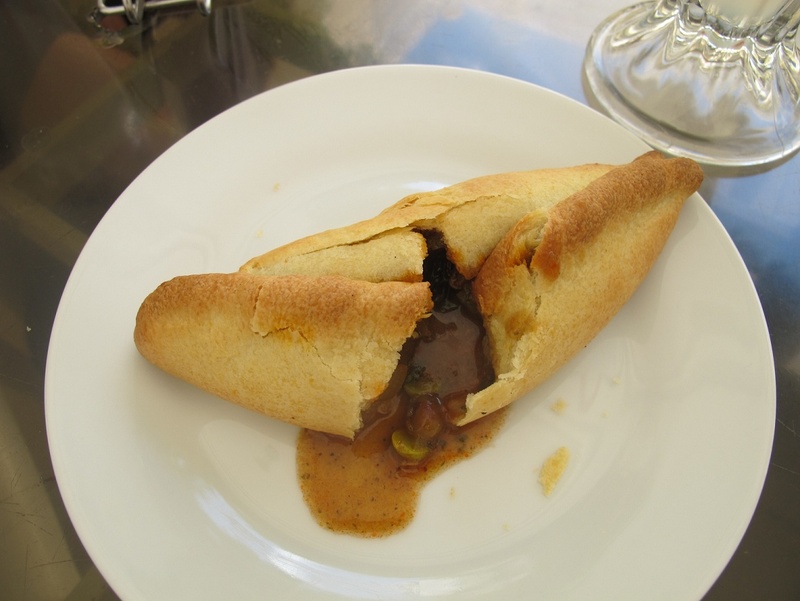 At high temperatures, the gelatine dissolves and there you are- a hot and spicy, flavour-filled, moistly delicious pastry. Yum! A nice oozy salteña at El Patio. We saw hundreds being served as we swooned on the patio under the hot Sucre sun. Salteña service at El Patio. Tarabuco Market Salteña Seller- isn’t she beautiful? The thing about salteñas is that you can really only find them in Bolivia, or so I thought. 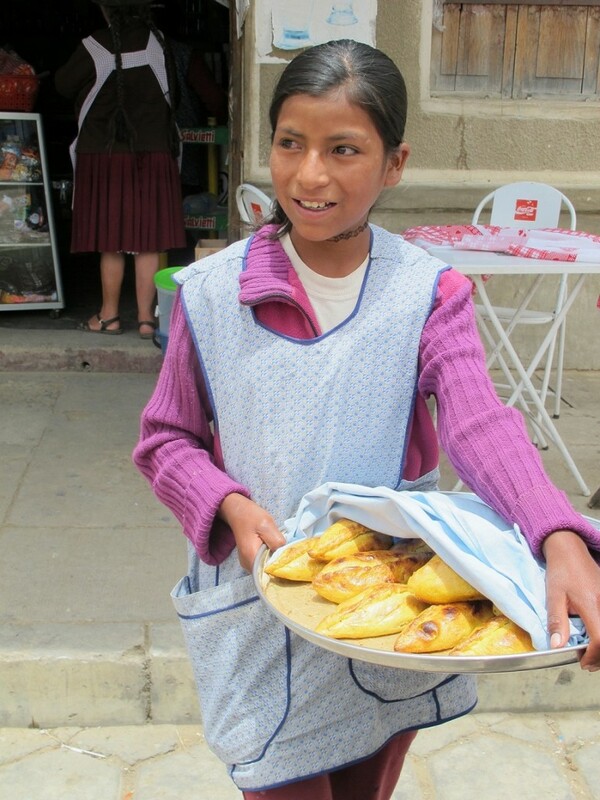 Turns out that, lucky for us, salteñas are also sold in Arequipa, in southern Peru. With its close proximity to Bolivia, I suppose it makes sense that Arequipeños would have an affinity for salteñas. Feeling more than a little depressed after leaving Bolivia, what a welcome surprise it was for us to find salteñas once again before heading north to Lima. Arequipa Airport- one last salteña for the road. Extra points for the hot sauce and lime, but a deduction for the lack of ooziness. On a scale of one to ten, I wouldn’t say my airport salteña was the best I have ever eaten, but the spicy sauce and lime on the side bumped it up a few notches on the “salteña-o-meter!” Some people might argue, that the nicely caramelized seam should earn it extra points. I am more of an oozy salteña person, myself. 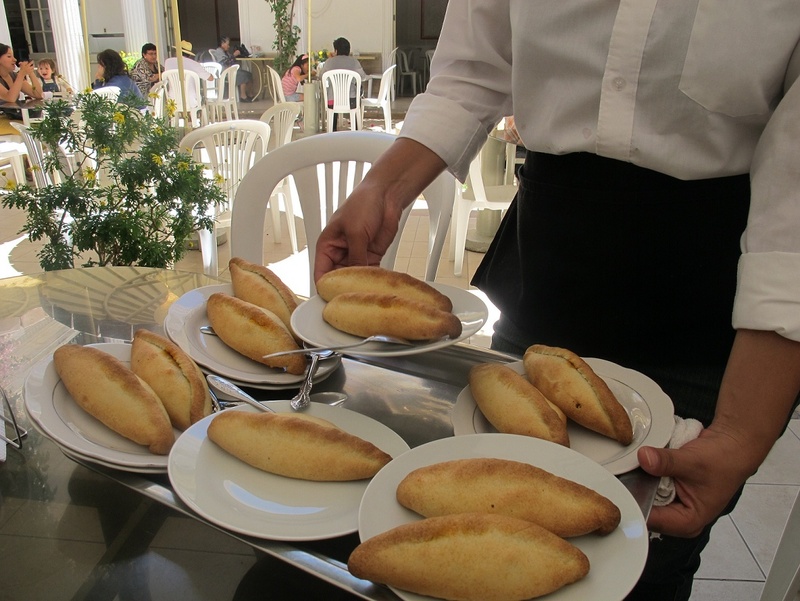 PS- There are empanadas in Bolivia and here is one perfectly, puffy, cheese-filled dream. But, it ain’t no salteña! This is not a salteña! Would the pizza oven at home be too hot to cook these? Conjugating Verbs and Drinking Mezcal: Studying Español in Oaxaca.